Wow, we've sure run a lot of contests on NextGen Player lately. Heck, we even have a Gears of War 2 contest on now and running until January 4. But we're never satisfied with the number of gifts we dole out, no sirree Bob, and we're always looking for that next great thing to give away. I'm very pleased to announce tonight the unveiling of our newest contest, in partnership with Eh Button and PLAY! A Video Game Symphony, aptly named 'Come out and PLAY!'. For this contest, NextGen Player and Eh Button will be awarding three lucky winners with tickets for two to attend PLAY! A Video Game Symphony performing live at the Jubilee Auditorium in Edmonton, Alberta on January 9, 2009. One winner will be announced each Monday starting on December 22. This contest is open to all legal residents of Alberta. Entering is very simple. All you have to do is send an email to contest@nextgenplayer.com with the subject line "Come Out And PLAY!". Each winner will receive two (2) tickets to see PLAY! 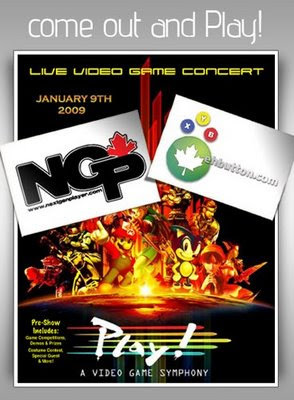 A Video Game Symphony live on January 9, 2009 in Edmonton, Alberta. The contest officially ends on January 4, 2009 at 11:59 pm ET. Winner(s) will be notified by email with details on how to claim their prize. You must be 18 years or older to enter the contest. Only one entry per email address will be accepted. Non-winning entries carry over to the following Round, where applicable. For more details on our general contest rules, click here. If you're interested in buying tickets for PLAY!, there's a special holiday promotion of 10% off any tickets purchased from Ticketmaster. Check out the Ticketmaster event page for more details.